AS sixth place finishes go, it's one of the happiest Daniel Ricciardo has had. Especially given his Brazilian Grand Prix looked like it was over after just two corners. Starting 14th after yet another engine-related grid penalty, Ricciardo was sent into a spin after contact between he, Stoffel Vandoorne and Kevin Magnussen as they battled in the middle of the field. After two straight races where engine issues sent him to an early bath, Ricciardo found himself dead last with a punctured tyre, unsure of what other damage his Red Bull might have had. "I saw some space on the outside - it's the best place to make up a handful of positions, so that's what I was going to do," Ricciardo told foxsports.com.au. "But obviously you do run a bit of a risk on the outside because you've got to trust the guys on the inside not to go into you. But it's racing, you've got to go for it. Moments before the contact between Ricciardo, Vandoorne (2) and Magnussen (20). "I had a bit of a look at a replay; I left them plenty of room, I don't think I need to put my hand up for anything there. "I guess three-into-one didn't work today." Officials would investigate the incident after the race but decided no further action was warranted, with no driver found wholly or predominantly to blame for the incident, which put both Vandoorne and Magnussen out on the spot. Fortunately the damage to the No. 3 Red Bull was limited to the cut tyre, a Safety Car period allowing Ricciardo to limp back to the pits for a new set of Pirellis without losing any more time. 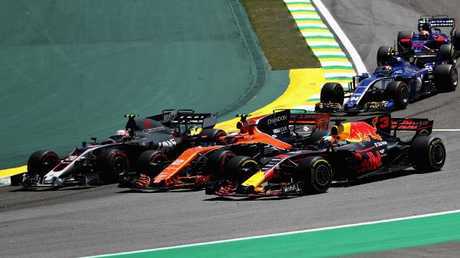 Ricciardo passed car after car as he charged back up the field, picking many of his rivals off with decisive moves at the end of Interlagos' long front straight. 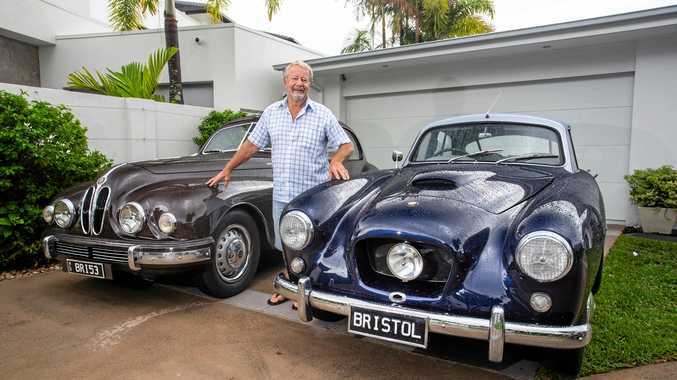 "It's a standard Sunday coming through from a long way back!" Ricciardo joked. "I think most of the ones into Turn 1 - unless I'd already passed the guy before the corner - I was always coming from a long way back. And I think there was one into Turn 4 on the Sauber, that was pretty fun. "Pretty happy with them. I always feel like I'm never really holding back, and I normally seem to pull the moves off, so pretty happy with that." Ricciardo took the chequered flag in sixth place, one spot behind Red Bull teammate Max Verstappen, both drivers well behind fourth-placed Lewis Hamilton, who himself had raced through the field after starting from pit lane. "I think that was our pace, top five and six was all we could do today," he said. "Lewis's pace was really strong so even if I didn't get collected in the first lap he would've got around me at some point during the race, and he nearly got onto the podium. Max was there but couldn't hold the pace of the leaders." Part of the issue was the need to turn the engine down in performance for the sake of reliability. Renault has endured numerous failures during F1's late-season swing through the Americas - Ricciardo taking grid penalties in both Mexico and Brazil - and Red Bull is keen on avoiding any more at the season finale. "At some point, maybe around mid race, we turned (the engine) down a bit to be a bit conservative," Ricciardo said. "I don't know what the others are doing, I don't know whether they're turning them down as much, but for sure, we have to get this to the chequered flag in Abu Dhabi so we had to be a bit conservative."